This piece by Weisberg outlines much of what is at stake in this election. Obama's defeat would say that when handed a perfect opportunity to put the worst part of our history behind us, we chose not to. What with the Bush legacy of reckless war and economic mismanagement, 2008 is a year that favors the generic Democratic candidate over the generic Republican one. Yet Barack Obama, with every natural and structural advantage, is running only neck and neck with John McCain, a subpar nominee with a list of liabilities longer than a Joe Biden monologue. Obama has built a crack political operation, raised record sums and inspired millions with his eloquence and vision. McCain has struggled with a fractious campaign team, deficits in clarity and discipline, and remains a stranger to charisma. Yet at the moment, the two appear to be tied. What gives? If it makes you feel better, you can rationalize Obama's missing 10-point lead on the basis of Clintonite sulkiness, his slowness in responding to attacks or the concern that he may be too handsome, brilliant and cool to be elected. But let's be honest: the reason Obama isn't ahead right now is that he trails badly among one group, older white voters. He lags with them for a simple reason: the color of his skin. Much evidence points to racial prejudice as a factor that could be large enough to cost Obama the election. That warning is written all over last month's CBS/New York Times poll, which is worth studying if you want to understand white America's curious sense of racial grievance. In the poll, 26 percent of whites say they have been victims of discrimination. Twenty-seven percent say too much has been made of the problems facing black people. Twenty-four percent say that the country isn't ready to elect a black president. Five percent acknowledge that they, personally, would not vote for a black candidate. Five percent surely understates the extent of the problem. In the Pennsylvania primary, one in six white voters told exit pollsters that race was a factor in his or her decision. Seventy-five percent of those people voted for Clinton. You can do the math: 12 percent of the white Pennsylvania primary electorate acknowledged that they didn't vote for Barack Obama in part because he is African-American. And that's what Democrats in a Northeastern(ish) state admit openly. Such prejudice usually comes coded in distortions about Obama and his background. To the willfully ignorant, he's a secret Muslim married to a black-power radical. Or—thanks, Geraldine Ferraro—he got where he is only because of the special treatment accorded those lucky enough to be born with African blood. Some Jews assume Obama is insufficiently supportive of Israel, the way they assume other black politicians to be. To some white voters (14 percent in the CBS/New York Times poll), Obama is someone who as president would favor blacks over whites. Or he's an "elitist," who cannot understand ordinary (read: white) people because he isn't one of them. We're just not comfortable with, you know, a Hawaiian. Then there's the overt stuff. In May, Pat Buchanan, who frets about the European-Americans losing control of their country, ranted on MSNBC in defense of white West Virginians voting on the basis of racial solidarity. The No. 1 best seller in America, "Obama Nation," by Jerome R. Corsi, Ph.D., leeringly notes that Obama's white mother always preferred her "mate" be "a man of color." John McCain has yet to get around to denouncing this vile book. Many have discoursed on what an Obama victory could mean for America. We would finally be able to see our legacy of slavery, segregation and racism in the rearview mirror. Our kids would grow up thinking of prejudice as a nonfactor in their lives. The rest of the world would embrace a less fearful and more open post-post-9/11 America. But does it not follow that an Obama defeat would signify the opposite? If Obama loses, our children will grow up thinking of equal opportunity as a myth. His defeat would say that when handed a perfect opportunity to put the worst part of our history behind us, we chose not to. In this event, the world's judgment will be severe and inescapable: the United States had its day, but in the end couldn't put its own self-interest ahead of its crazy irrationality over race. Choosing McCain, in particular, would herald the construction of a bridge to the 20th century—and not necessarily the last part of it, either. McCain represents a cold-war style of nationalism that doesn't get the shift from geopolitics to geoeconomics, the centrality of soft power in a multipolar world or the transformative nature of digital technology. This is a matter of attitude as much as age. A lot of 71-year-olds are still learning and evolving. But in 2008, being flummoxed by that newfangled doodad, the personal computer, seems like a deal breaker. At this hinge moment in human history, McCain's approach to our gravest problems is hawkish denial. I like and respect the man, but the maverick has become an ostrich: he wants to deal with the global energy crisis by drilling, our debt crisis by cutting taxes, and he responds to threats from Georgia to Iran with Bush-like belligerence and pique. You may or may not agree with Obama's policy prescriptions, but they are, by and large, serious attempts to deal with the biggest issues we face: a failing health-care system, oil dependency, income stagnation and climate change. To the rest of the world, a rejection of the promise he represents wouldn't just be an odd choice by the United States. It would be taken for what it would be: sign and symptom of a nation's historical decline. This was an awesome speech by Sen. John Kerry. Thank you so much. Four years ago, you gave me the honor of fighting our fight. I was proud to stand with you then, and I am proud to stand with you now, to help elect Barack Obama as president of the United States. In 2004, we came so close to victory. We are even closer now, and let me tell you, this time we're going to win. Today, the call for change is more powerful than ever, and with more seats in Congress, with more people with more passion engaged in our politics, and with a President Obama, we stand on the brink of the greatest opportunity of our generation to move this country forward. The stakes could not be higher, because we do know what a McCain administration would look like: just like the past, just like George Bush. And this country can't afford a third Bush term. Just think: John McCain voted with George Bush 90 percent of the time. Ninety percent of George Bush is just more than we can take. Never in modern history has an administration squandered American power so recklessly. Never has strategy been so replaced by ideology. Never has extremism so crowded out common sense and fundamental American values. Never has short-term partisan politics so depleted the strength of America's bipartisan foreign policy. George Bush, with John McCain at his side, promised to spread freedom but delivered the wrong war in the wrong place at the wrong time. They misread the threat and misled the country. Instead of freedom, it's Hamas, Hezbollah, the Taliban and dictators everywhere that are on the march. North Korea has more bombs, and Iran is defiantly chasing one. Our mission is to restore America's influence and position in the world. We must use all the weapons in our arsenal — above all, our values. President Obama and Vice President Biden will shut down Guantanamo, respect the Constitution, and make clear once and for all, the United States of America does not torture, not now, not ever. We must listen and lead by example because even a nation as powerful as the United States needs some friends in this world. We need a leader who understands all our security challenges, not just bombs and guns, but global warming, global terror and global AIDS. And Barack Obama understands there is no way for America to be secure until we create clean energy here at home, not with a little more oil in five, 10 or 20 years, but with an energy revolution starting right now. I have known and been friends with John McCain for almost 22 years. But every day now I learn something new about candidate McCain. To those who still believe in the myth of a maverick instead of the reality of a politician, I say, let's compare Senator McCain to candidate McCain. Candidate McCain now supports the wartime tax cuts that Senator McCain once denounced as immoral. Candidate McCain criticizes Senator McCain's own climate change bill. Candidate McCain says he would now vote against the immigration bill that Sen. McCain wrote. Are you kidding? Talk about being for it before you're against it. Let me tell you, before he ever debates Barack Obama, John McCain should finish the debate with himself. And what's more, Senator McCain, who once railed against the smears of Karl Rove when he was the target, has morphed into candidate McCain who is using the same "Rove" tactics and the same "Rove" staff to repeat the same old politics of fear and smear. Well, not this year, not this time. The Rove-McCain tactics are old and outworn, and America will reject them in 2008. So remember, when we choose a commander-in-chief this November, we are electing judgment and character, not years in the Senate or years on this earth. Time and again, Barack Obama has seen farther, thought harder, and listened better. And time and again, Barack Obama has been proven right. When John McCain stood on the deck of an aircraft carrier just three months after 9/11 and proclaimed, "Next up, Baghdad!" Barack Obama saw, even then, "an occupation of "undetermined length, undetermined cost, undetermined consequences" that would "only fan the flames of the Middle East." Well, guess what? Mission accomplished. So who can we trust to keep America safe? When Barack Obama promised to honor the best traditions of both parties and talk to our enemies, John McCain scoffed. George Bush called it "the soft comfort of appeasement." But today, Bush's diplomats are doing exactly what Obama said: talking with Iran. So who can we trust to keep America safe? When democracy rolled out of Russia, and the tanks rolled into Georgia, we saw John McCain respond immediately with the outdated thinking of the Cold War. Barack Obama responded like a statesman of the 21st century. So who can we trust to keep America safe? When we called for a timetable to make Iraqis stand up for Iraq and bring our heroes home, John McCain called it "cut and run." But today, even President Bush has seen the light. He and Prime Minister Maliki agree on — guess what? — a timetable. So who can we trust to keep America safe? The McCain-Bush Republicans have been wrong again and again and again. And they know they will lose on the issues. So, the candidate who once promised a "contest of ideas" now has nothing left but personal attacks. How insulting to suggest that those who question the mission, question the troops. How pathetic to suggest that those who question a failed policy doubt America itself. How desperate to tell the son of a single mother who chose community service over money and privilege that he doesn't put America first. No one can question Barack Obama's patriotism. Like all of us, he was taught what it means to be an American by his family: his grandmother who worked on a bomber assembly line in World War II, his grandfather who marched in Patton's army, and his great uncle who enlisted in the army right out of high school at the height of the war. 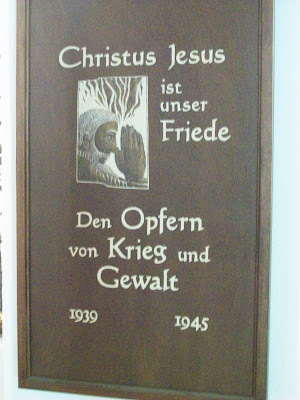 And on a spring day in 1945, he helped liberate one of the concentration camps at Buchenwald. Ladies and gentlemen, Barack Obama's uncle is here with us tonight. Please join me in saluting this American hero, Charlie Payne. Charlie, your nephew, Barack Obama, will end this politics of distortion and division. He will be a president who seeks not to perfect the lies of swift-boating, but to end them once and for all. This election is a chance for America to tell the merchants of fear and division: you don't decide who loves this country; you don't decide who is a patriot; you don't decide whose service counts and whose doesn't. Four years ago I said, and I say it again tonight, that the flag doesn't belong to any ideology. It doesn't belong to any political party. It is an enduring symbol of our nation, and it belongs to all the American people. After all, patriotism is not love of power or some cheap trick to win votes; patriotism is love of country. Years ago when we protested a war, people would weigh in against us saying, "My country, right or wrong." Our answer? Absolutely, my country, right or wrong. When right, keep it right. When wrong, make it right. Sometimes loving your country demands you must tell the truth to power. This is one of those times, and Barack Obama is telling those truths. In closing, let me say, I will always remember how we stood together in 2004, not just in a campaign but for a cause. Now again we stand together in the ranks, ready to fight. The choice is clear; our cause is just; and now is our time to make Barack Obama the next president of the United States. Thank you. Not far from the Bismarck museum and on the grounds of a nice little restaurant, was this memorial. The writing on its front has been worn away so that I could not read it. 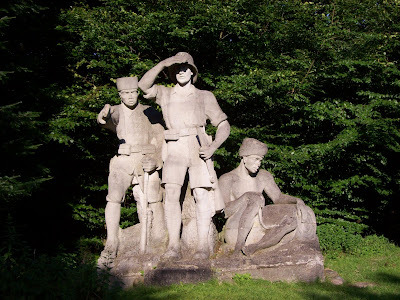 However, it appears to be a monument dedicated to the German empire in Africa. At right is a native African who seems sad and disconsolate. At left is a native African, looking confident and satisfied, who is helping the soldier at center. The message seems to be that some Africans who cooperated with the creation of German empire in Africa and those who didn't were doomed to defeat and unhappiness. Many Germans do believe that they treated the native peoples better than other Europeans while they were building their African empire. This idea is not really borne out by the facts. 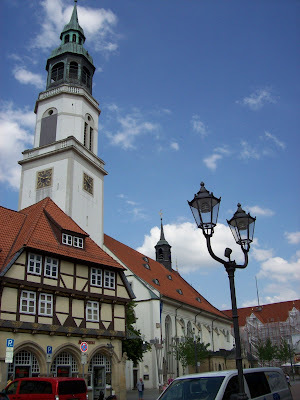 Celle is a beautiful town near Luneburg. 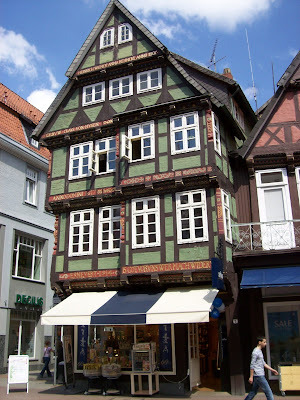 It's buildings are quite different from the Hanseatic cities like Luneburg. 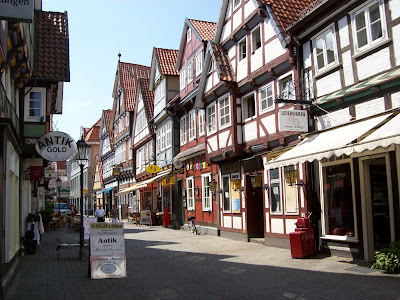 It is full of half-timbered houses and buildings. There is a palace there for the family of the House of Hannover who called this place home for many years. George III of American revolunary fame was a member of this royal family and a photo of him can be found in the palace. 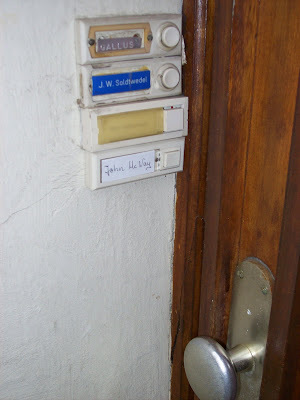 You can tell you are becoming a local resident when your name actually appears on the door of your apartment building. At bottom, you can see I've become a fixture of Lueneburg. 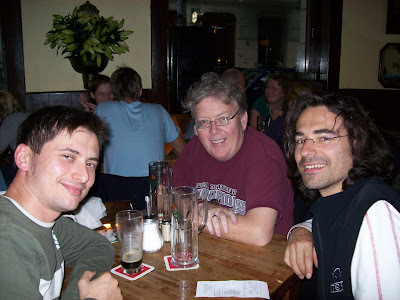 At top, Soeren, Eugene, and I have "ein bier" at a Hamburg night spot after visiting the city's immigration museum. 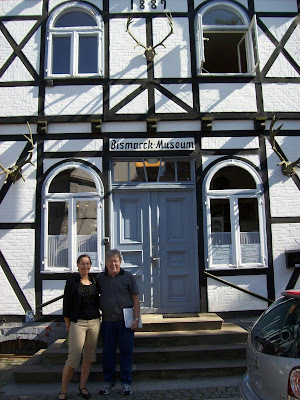 A couple of weeks ago, one of my colleagues here, Uta Roepcke, suggested I might be interested in seeing the Otto von Bismarck museum near her home outside of Hamburg. Bismarck led the creation of the modern state of Germany in the 1870s through a series of wars and negotiations. Naturally, I was interested. 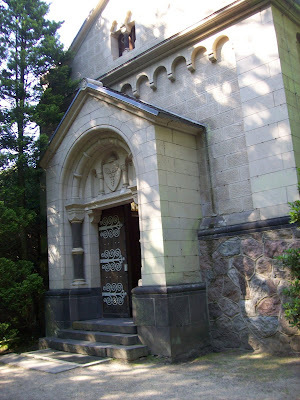 At top is his mausoleum. 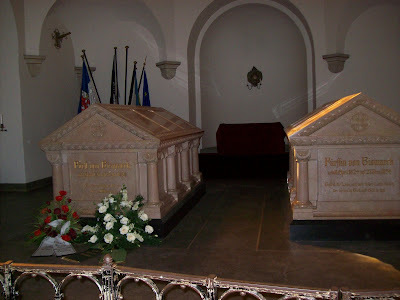 Next is his coffin on the left (with flowers) and his wife's on the right. The lighting was very bad. 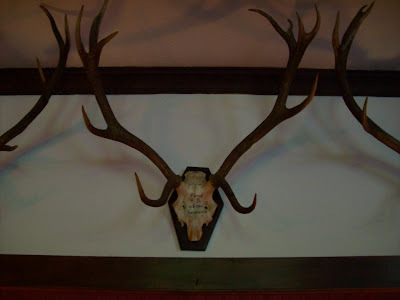 In a beautiful tavern/restaurant/bier garten in a nearby place, the walls are lined with the trophies of deer that Bismarck himself shot. Etched into the central piece is the date at which the animal was taken. At bottom, Uta and pose in front of the museum. The museum is an interesting collection of memorabilia but what is perhaps more valuable is an historical institute established in connection to the museum to study the life and time of the Iron Chancellor, as he was called. The city of Bismarck, North Dakota, has provided a series of gifts and proclamations to the museum which are on display. I'm sure I am unusual among visitors to the museum in that I've actually been to Bismarck, ND. 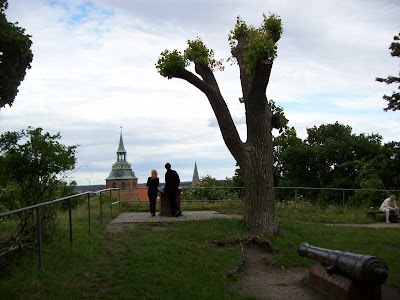 Just outside of Luneburg is a place called the Kalkberg. 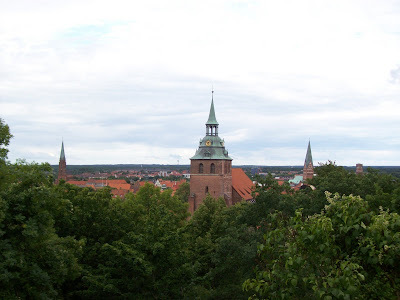 Very early in Luneburg's history, the town was ruled by a duke who had a palace on the Kalkburg. 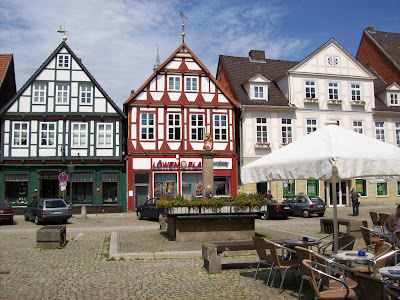 About 1,000 years ago, the people revolted and attacked the the palace and the duke and his family and forces fled to take up residence in nearby Celle. At top is the view from the Kalkberg with the steeples of St. Nicolai at the left, St. Michaelis in the foreground center, and St. Johannis on the right. 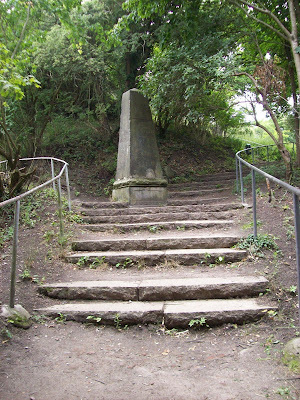 Next, is a monument to the people who attacked the palace. 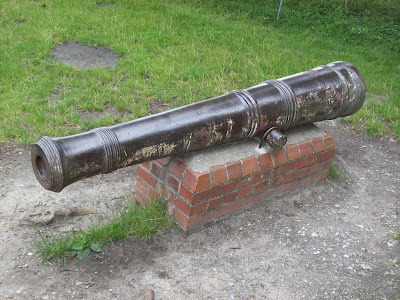 Then there is a medieval cannon. At bottom, is another view of some walkers enjoying the view from the Kalkberg. 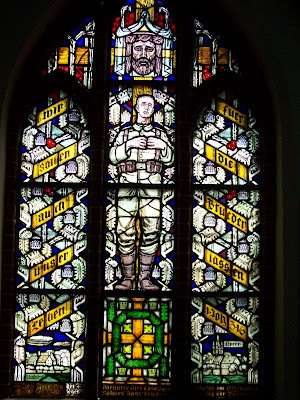 At top is a stained glass window for a first world war soldier, next is a plaque dedicated to Christ who brings peace and for the victims of war and aggression.Next is a list of the dead from the parish in the First World War. 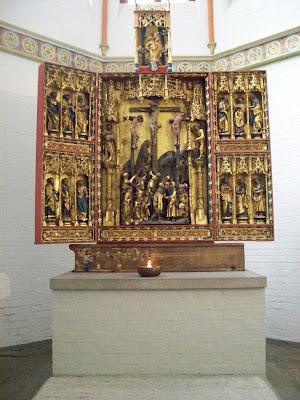 At bottom is the altar from St. Lamberti's, Luneburg's fourth medieval church that fell victim to subsidence because of the salt mines in the city. 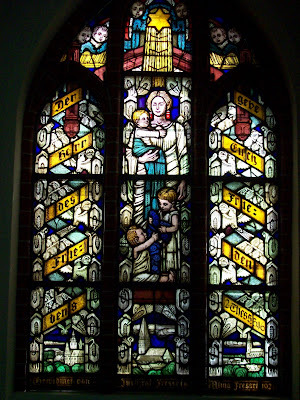 It was pulled down in the late 19th century. 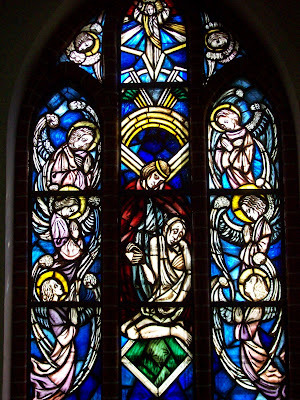 St. Johannis contains some beautiful stained glass work. 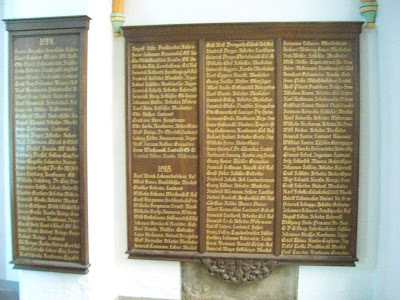 Most of it appears to date from the nineteenth century although some of it comes from between the First and Second world wars. 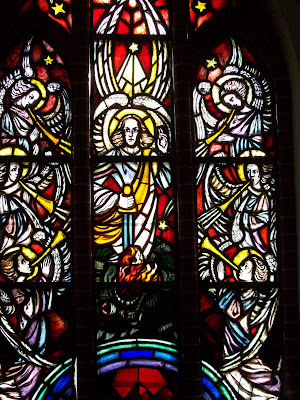 Because Luneburg was not bombed during WWII, the stained glass survived. 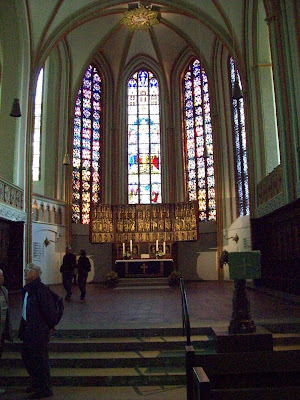 The church was erected between 1300 and 1370, although it has undergone some changes, particularly some exterior reconstruction in the 18th century. 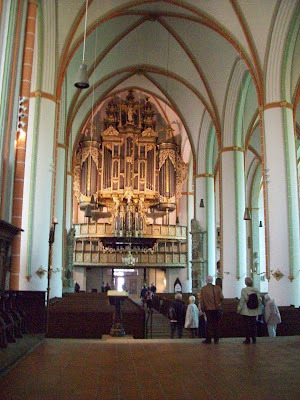 Beautiful St. Johannis church in Lueneburg. The medieval structure has undergone some changes over time. 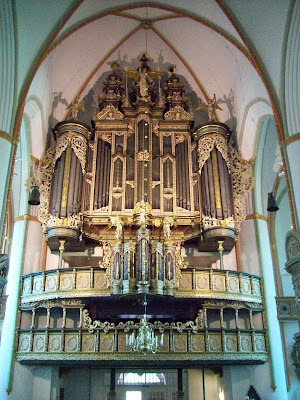 The massive organ, one of the finest in northern Germany, was once played by J.S. Bach, who lived in the town when a child. A UC alumnus from CCM was responsible for much of recent restoration of the organ.